According to a December 2016 report by Redfin, 7 Denver metro area neighborhoods are among the most competitive in the U.S. for home-buyers. 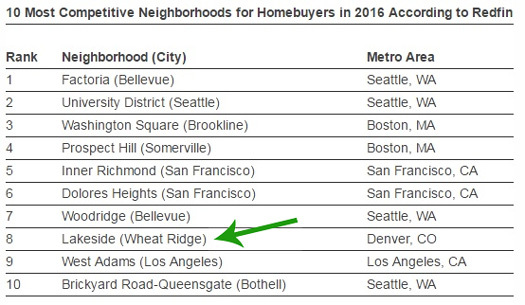 The town of Wheatridge, a western suburb of Denver, is in the top ten. 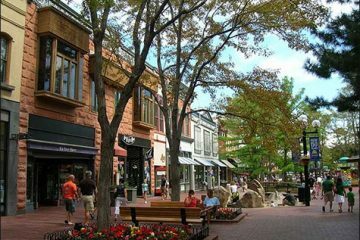 The popular neighborhoods in the Denver metro area are; West Pleasant View in Golden, College View in Denver, Hoffman Town in Aurora, Highline Villages in Aurora, Union Square in Lakewood, and Horseshoe Park in Aurora are very competitive for home buyers. Redfin researched real estate trends in numerous metropolitan areas throughout the country and then scored the 30 “most competitive” neighborhoods for home buyers during 2016. Among the factors used in determining the final results were the median number of days on the market (when the home is not under contract) and the percentage of the average sale-to-list price. Other metrics took into account demand such as price appreciation and the ratio of homes that sold over the asking price. Most Denver area residents recognize the fact that the local real estate market is in high-demand right now with prospective home buyers making purchase offers on many homes. So how do buyer’s get the home they want in this kind of market to purchase a home? In a real estate market with huge demand, it’s crucial to have your financing set up before looking at homes or putting in offers. The reason to do this is it will increase your odds of success. If you’re thinking of buying a home in Denver, or anywhere in Colorado, you should get pre-approved prior to searching for a home. At the very least, check your credit report for any errors because a borrower with a 615 credit score may have a more difficult time getting approved than someone with a 730 credit score. What Do the New Loan Limits in 2018 Mean For You?